As a transplant Chicagoan, one of my favorite daily rituals is calling 311 to report the potholes that make my street un-driveable. Fellow Chicagoan and artist Jim Bachor is taking a more proactive approach: He's repairing them, but also turning them into tiny little jokes. Bachor is an artist who works mainly with mosaic. He's fascinated by the ancient world, he says in his artist's statement, but also clearly rooted in this one: On his site, you can find pieces like the Starbuck's logo and Hostess twinkies rendered in beautiful glass mosaics. He also lives in a city—Chicago—that just endured one of the most brutal winters on record. And the streets show it. 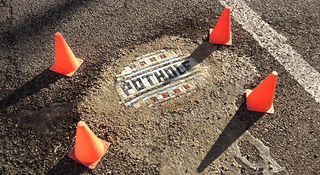 So beginning in January, Bachor's taken to the streets to fill in particularly heinous potholes with beautifully-rendered little mosaics that usually resemble the Chicago city flag. Overlaid, often, is a joke—like one that simply read POTHOLE. When I got in touch with Bachor, he sent me photos of his latest repair job. "It features the phone number of a local auto repair shop!," he said by email. The Department of Transportation continues to work diligently to fill the numerous potholes that have appeared on our streets as a result of the historic winter. Mr. Bachor and his art are proof that even the coldest, harshest winter can not darken the spirits of Chicagoans.